Up until recently, I’ve been a one-trick-pony when it comes to steak. I only make one cut of steak at home – filet mignon. Why? Well, because it’s delicious, but also because, after making it so many times, my husband + I have figured out how to perfectly cook it. While I eye different cuts of meat at the store, I always reach for the time-tested filet mignon rather than try something new. Until now. After seeing some great-looking skirt steak recipes recently, I decided to finally branch out + try cooking this new-to-me cut of meat. So, how was it? So very tasty! Why did it take me so long to finally try a different cut of meat?! The chimichurri, which works as both the marinade AND the dipping/topping sauce, was simple + quick to make, + packed with bright, bold, delicious flavor. And the steak itself? Just wonderful – tender, juicy, + full of wonderful, savory, rich flavor. I worried that this cut of steak would be tough or chewy, but thanks to the marinade + cutting it against the grain, it was actually really tender. My husband + i both agreed that it’s one of the best steak recipes we’ve ever tried, + will definitely be confidently trying other cuts of meat now that our first attempt was so deliciously successful! Combine all ingredients in a bowl + season to taste with salt + pepper. Divide the chimichurri between 2 bowls. Use half as the steak marinade + reserve half for use as the dipping sauce. Place the steak in a large baking dish + pour half of your prepared chimichurri over it. Turn to coat; cover + marinate in the refrigerator for 2 hours. Preheat grill to high. Let the steak come to room temperature. Remove it from the marinade + season with salt + pepper. Grill for 4 to 5 minutes on one side until browned + seared, flip, + grill another 4 to 5 minutes for medium-rare doneness. Grill for 1-2 minutes longer for medium. Remove from the grill, let the meat rest for 10 minutes, + slice thinly against the grain on a bias. Serve with the remaining chimichurri either drizzled on top, or on the side. Sometimes, it’s just easier to choose something that’s familiar and that I know how to make. But it almost always pays off when I step outside of my boundaries and try something new. I’m so glad this recipe was a success for you. Chimichurri on steak makes me swoon! This sounds fab! I’ve never had chimichurri before, but it looks delicious! Perfect complement to a crispy grilled steak. Yum! It’s fantastic with steak, but it’s also great with grilled chicken and fish, too. NOM! 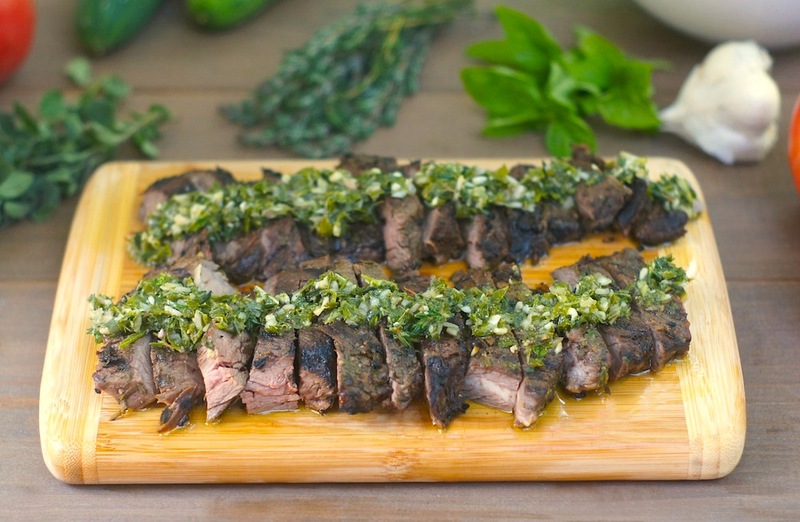 My hubby makes skirt steak with chimichurri often. Its a great cut of meat and the sauce is one of our favorites. i loooove chimichurri sauce and i’ve only bought skirt steak a few times but love how easy it is to prepare! will have to try this! I love chimichurri sauce! And it’s awesome on skirt steak. Looks like you mastered this cut of meat. Looks beautiful and delicious Amy! Chimichurri and steaks are a match made in heaven, your steak looks perfect. Great work, Amy! I love skirt steak, although sometimes it is a bit too fatty for me – but all that fat just adds tons of flavor. Sometimes I select flank steak which is also wonderful to use with marinades. This sounds delicious. Meat cooked like this is one of Bart’s favorite meals. I think I’ll give this one a go this week. Thanks, O Fearless One, you TV star you! This might sound silly, but I am really looking forward to posts of you cooking & baking with the little one. I know it is a ways off, but I always think of it when I visit your site. Hi Adri! Flank steak is my next to try, actually. I’m intrigued by it, too, and I prefer less fatty cuts of meat, so it sounds like I’ll love it. And thank you SO much for your kind words, as always. I am so excited for the day when my little one can help me in the kitchen, too – not long now until I can introduce her to the basics of measuring, pouring, strirring, etc. It’s going to be so exciting!! I love chimichurri as a dipping sauce. Ah, RIP Rumba and thanks for introducing me to chimichurri (they also used it for steak). I recently tried skirt steak, too and we enjoyed it. I love chimichurri with steak – it is so delicious and fresh and compliments the meat very well. Looks great! Amy, this meat looks SO mouthwatering! 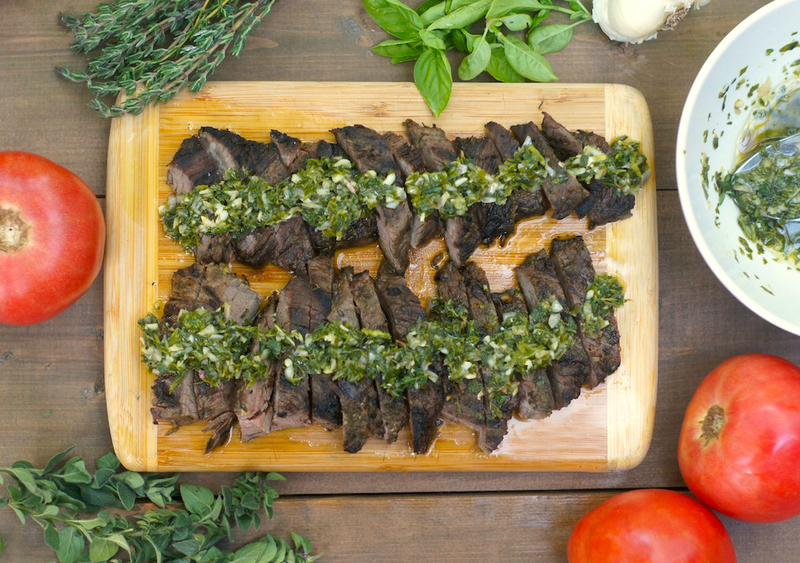 We love to grill flank steak and serve it with chimichurri. It’s the perfect flavor combination! Ooooh, we love chimichurri – this looks terrific! I just filled up all the freezers with Butch, our new cow. We got several packages of steak cuts (though most of Butch comes to us in ground beef form) and I’ve got plenty of herbs, so thanks for a very timely post. I have tried chicken with chimichurri and your posts is tempting me into trying it with lamb meat. Beautiful presentation and a wonderful meal indeed. I think my favorite steak at home is strip steak, but like you that’s because I’ve learned how to cook it. Cast iron and then oven. But skirt steak is so good and I often forget about it. You have tickled my fancy today to eat some meat. Great picture too. Such a pretty sauce! When Mr. Spicy and I cook steaks, we tend to do a lot of rib eye, but always fun to try something new for a change. Looks delicious! I can’t believe I’ve never made chimichurri! Skirt steak is one of my faves so I definitely need to give this a try! Love the presentation too! YUM! I just tried chimichurri for the first time a few weeks ago! So good! I love a nice steak, so always looking for new recipes, ideas and fresh things to try out, this looks delicious. This looks delicious! I don’t have a grill–can I cook in a pan? I’m sure you could, Mary, but I haven’t tried it that way yet. If I was going to try it, I’d make sure to use an oil with a high smoke point, heat the pan/oil to high/med-high, and aim for 4-5 minutes a side. Good luck, and report back how it goes!